Using silhouettes of people, this design concept is based on a business meeting theme. Presented using a blend of different shades of bright red colours, it has the name of your business overlaid on top of a vibrant textured background. As regards your corporate branding, it is pretty easy to apply your existing brand style guidelines to your new graduate site. If you already have a company logo, you can upload JPG or GIF pictures and quickly change the design to suit your requirements. 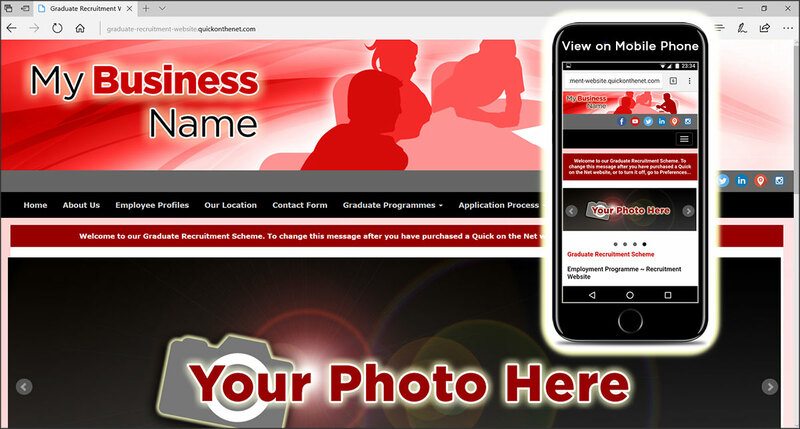 Graduates are keen to tap into feedback from your existing employees, so you can use our gallery tool to present profiles from current employees, with a photo or video and a click-through page for each employee. Create web pages to outline your recruitment procedure and describe what it is like to work for your company. If you offer an internship scheme or structured training programmes for new employees, use this site to promote your offering.